We're Don and Lisa DeLucia. This web site is dedicated to outdoors life caving and touring the sites we have encountered in our travels over the past 30 plus years. We are cavers and outdoors people and nothing can keep us away from a good adventure for too long. Our children, Dani and Josh share the same sense of adventure we do. We have dedicated this site to you. We bring images from underground areas you thought you could never see - some of these gems are no longer accessible to the public. There are images from the National Parks, Monuments, Forests and other famed sites across the USA and Mexico. Some of the images we provide depict areas that have changed drastically over the years. Lisa and I have been together for over 30 years of marriage and were very avid outdoors people even prior to knowing one another. Both of us spent family vacations at National Parks and local camping spots. I eventually became a consummate surfer; Lisa was a beach girl and cheerleader. When we met, sparks flew and we've been together ever since. We went camping everywhere we could and got into caving; this was something we both could share that provided adventure, exploration, climbing (something we'd always wanted to try) and it satisfied our outdoor craving with the camping involved. When I was a young boy I became aware of a cave system in the Kings Canyon area. I remembered a tour guide from a commercial cave talking about it on a tour that my Mom took me on. That very same day my parents and I saw a group of cavers coming down the mountain worn out and muddy. I filed that knowledge away for a future use. 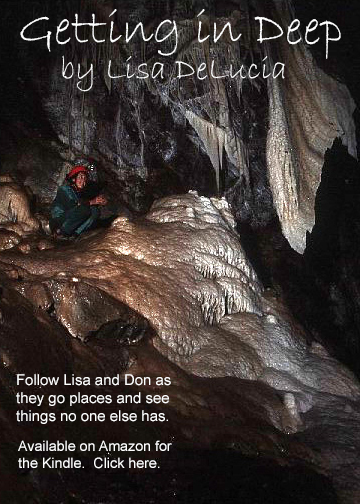 I shared this information with Lisa at a time when she was writing a college term paper on a "different" activity and she chose "spelunking". We went to the library and got every book they had on caves and caving. She read them and so did I. We were both intrigued. More like ...HOOKED! We decided to go find that cave system I knew of as a boy and start exploring it. We had all the book knowledge we needed. We started off small and well... follow us via the web site and we'll take you to some of the places we've been both on and off the beaten trail. Naturally we also visited many other sites of interest amidst the caving adventures which are also represented quite prominently on the site. While you are here, please visit our shop where we bring you DVD slide shows to music.